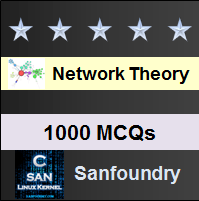 This set of Network Theory Multiple Choice Questions & Answers (MCQs) focuses on “Instantaneous Power”. 1. In purely resistive circuit, energy delivered by source is ____________ by resistance. Explanation: In purely resistive circuit, energy delivered by source is dissipated in the form of heat by resistance and is not stored as either electric field or magnetic field. 2. In inductor, the energy delivered by source is ____________ by inductor. Explanation: In inductor, the energy delivered by source is stored as magnetic field by inductor and is not dissipated in the form of heat or stored as electric field. 3. In capacitor, the energy delivered by source is ____________ by capacitor. Explanation: In capacitor, the energy delivered by source is stored as electric field by capacitor and is not stored as magnetic field or dissipated in the form of heat. 4. If there is complex impedance in a circuit, part of energy is ____________ by reactive part and part of its energy is ____________ by the resistance. Explanation: If there is complex impedance in a circuit, part of energy is alternately stored and returned by reactive part and part of its energy is dissipated by the resistance. The amount of energy dissipated is determined by relative values of resistance and reactance. 5. The equation of instantaneous power is? Explanation: The equation of instantaneous power is P (t) =(VmIm/2)(cos⁡(2ωt+θ)+cos⁡θ). It consists of two parts. One is a fixed part and the other is time varying which has frequency twice that of the voltage or current wave forms. 6. The time varying part in the equation of instantaneous power has frequency ________________ that of the frequency of voltage or current wave forms. Explanation: The time varying part in the equation of instantaneous power has frequency twice that of voltage or current wave forms and the other part is a fixed part. Explanation: Instantaneous power is negative, when voltage and current have opposite sign that is if voltage is positive, the current is negative and if current is positive, the voltage is negative. 8. In P (t) equation, if θ=0, then P (t) =? Explanation: In P (t) equation, if θ=0⁰, then P (t) =(VmIm/2)(1+cos⁡2ωt). The power wave has a frequency twice that of the voltage or current. Here the average value of power is VmIm/2. 9. The average value of power if θ=0⁰ is? Explanation: The average value of power if θ=0⁰ is VmIm/2. So, average power = VmIm/2 at θ=0⁰. When phase angle is increased the negative portion of the power cycle increases and lesser power is dissipated. 10. At θ=π/2, positive portion is __________ negative portion in power cycle. Explanation: At θ=π/2, the area under positive portion is equal to the area under negative portion in power cycle. At this instant the power dissipated in the circuit is zero.